For customers desiring a higher performance coating, we offer a variety of options. With special spray equipment, this service magnetizes paint molecules to increase its adhesion to metal surfaces. Many of our customer’s desiring this service are looking to paint metal lockers or other powder coated items. We offer protective coatings to reduce scrapes in painted surfaces. These types of coatings can be added to most systems making them a very versatile product. Also these higher performance coatings reduce fading overtime of painted surfaces for exterior surfaces. Mainly for exterior concrete, plaster, and CMU, Elastomeric coatings reduces the visibility of cracking in walls because the paint stretches to continue to cover as needed even as cracks expand. Zolatone is a painting system that provides excellent wall protection and durability similar to Vinyl Wall Covering at a cheaper price. Its multi-colored appearance is an excellent way to excite a room, and should definitely be considered if a higher performance coating is desired. The link below provides more information on Zolatone and Polomyx painting. 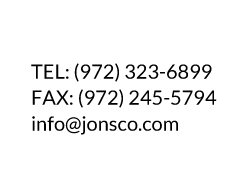 For nearly 20 years, Jonsco, Inc. has served the Dallas/Fort Worth metroplex and surrounding area with superior commercial and industrial painting services. We're proud to be considered among the best in the business and we strive to uphold that reputation on each and every job we complete. Please give us a brief description of how we can help you today!